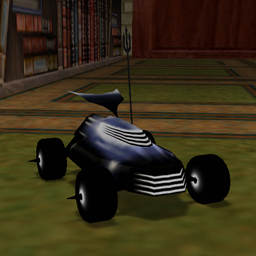 That's a fan-made car based on the Re-Volt gallery picture lib2a.bmp: a Paul Phippen's sketch of the original appearance of Genghis Kar, named as 'Devil' in the early Re-Volt development. It is black with some light purple spots. Wheels have spikes and the top of the antenna has a trident. Parameters do not differs too much from Genghis Kar. *Remodeled body and wheels to make it more similar to the drawing.